Ever fancied a Subway soft Italian roll at home? 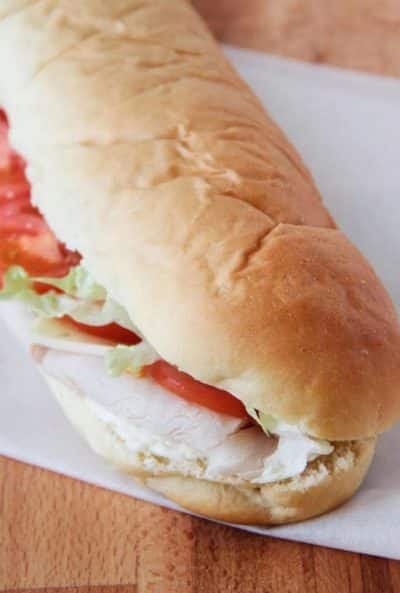 What makes Subway's bread rolls the perfect rolls for a sandwich are that they are always soft and chewy with a lightly crisp crust. Top tip! If you fancied a cheesy roll instead of the plain Italian style Subway bread roll, sprinkle grated cheddar cheese, with a touch of garlic salt over the dough before you put the rolls in to bake. Combine the yeast, warm water, olive oil, with sugar and salt then stir until the yeast mixture is nicely combined. Let the mixture stand for around 10 minutes. Then add 1 cup of flour and mix with a dough hook for approximately 5 minutes. Add the flour continuously and slowly whilst mixing until the dough is soft. Let the dough mix for a further 7-8 minutes until it is lightly sticking to the bowl. Next, empty the dough onto a floured worktop and knead the mixture until soft and smooth. Once soft, place the dough in a bowl, cover the bowl with cling film and leave it to rise for approximately half an hour. Once the dough has risen, divide it into 4 balls, and roll each ball into a long loaf. Place each loaf onto a baking tray lined with a baking sheet, leaving at least a couple of inches gap between the loafs. Once again cover the loafs with cling film or plastic film and leave to rise. Wait until the loaves have doubled in size, approx an hour. Preheat the oven to 350 degrees Fahrenheit, 175 degrees Celsius or gas mark 4. Bake the loaves for 23-25 minutes, until very light brown. Remove the loaves from the oven and rub a small amount of butter on the top, and leave to cool.